Experience the excitement as students transform before your very eyes as Doc not only encourages academic success, but success in ALL facets of their lives. Without a doubt, youth motivational speaker and master teacher Dr. Adolph Brown offers the most unique, informing, relatable, inspiring and entertaining presentations THAT STICK for today's young people. All generations K-12 and college campus students alike have had their fair share of challenges and crises. Today, kids are experiencing scary news on a regular basis coupled with the pressures of social media to "fit in." Everything from shootings, cyber-attacks, school violence to terror attacks have become a harsh reality. Although it may be tough, kids today can be taught to be tougher. Dr. Brown takes young people on a growth-mindset journey to find the light in the midst of so much darkness. Kids will learn that all is not perfect in the world but that they can make it better. Dr. Adolph Brown became the best at-risk and leadership youth motivational speaker by overcoming "insurmountable" obstacles himself on his journey from an at-risk student of abject poverty to a doctor of clinical and educational psychology and a married Christian father of eight uniquely wonderful children. As a former at risk inner-city urban youth who spent his summers in rural Virginia on his grandparent's farm, Dr. Brown knows firsthand about the struggles of today's young. He receives countless accolades and positive acknowledgements from his tremendous impact on student audiences and their entire school community from k-12/k-14 to higher education community college & university students. As a clinical and educational psychologist, former special education and alternative education teacher, he successfully addresses issues related to anti bullying, college & career readiness, diversity, LGBTQIA+, adolescent & teen mental health, Black History Month, at risk students, character, standardized test anxiety, peer pressure, drug awareness, leadership, digital citizenship, fighting, healthy choices, dating, entrepreneurship, the importance of education, sportsmanship, and the SUCCESS Mindset. Dr. Brown has also enjoyed his long-standing relationship with FCCLA, FBLA, and HOSA. To date, as a school speaker and Title I trainer Dr. Brown has successfully addressed as many as 26,000 students at once to intimate focus groups of 12 students. His most memorable positive impact has been students denouncing their gang affiliations and giving Dr. Brown their gang paraphernalia. Once in a Virginia school, a student gave Dr. Brown a loaded handgun after the presentation. The Dream Team is comprised of today's best and most diverse group of youth motivational teacher speakers. They began as group of friends who made the choice not to give up; now they are a family of encouraging individuals. They are collectively known as the Dream Team because they never allowed anything to stand between them and their dreams. Individually, team members have experienced the challenges associated with bullying, family problems, language barriers, English as a Second Language, being black & brown boys, alienation, the effects of family alcohol and drug abuse, fighting, racism and self-esteem. Through their stories of trials and triumphs of overcoming being a “Newcomer to Overcomer,” "Be A Buddy, Not A Bully," "At-Risk to At-Promise, "Be Better, Not Bitter," “Hugs Not Drugs,” “BE-YOU-TIFUL” and “It's Not How You Start..” the Dream Team connects with all through powerful messages, uplifting music and lots of motivation. With one or more of Special Guests Meghan Shanley International Soul/R&B Music Recording Artist / Former Miss Virginia, Javier Trejo Educator, Mentor, Youth Advocate, & Tech Guru, Tray Chaney of HBO's "The Wire," Musician, & Author, and Jahzeel Mumford, Top 10 Popstar 2 Finalist & Tyler Perry Actor. The Character, Choices & Consequences Student Success is the most sought-after and highly effective youth motivational, resistance skills and values clarification assembly today. The tour team is compromised of motivational educators from all walks of life. They are collectively known as the Dream Team because they never allowed anything to stand between them and their dreams. Individually, team members have experienced and overcome the challenges associated with bullying, family problems, language barriers, English as a Second Language, being black & brown in red-white & blue, alienation, the effects of family alcohol and drug abuse, aggression, racism and self-esteem. 1. Through their stories of trials and triumphs of overcoming being a Mexican “Newcomer to Overcomer,” "Be A Buddy, Not A Bully," "At-Risk to At-Promise, "Be Better, Not Bitter," “Hugs Not Drugs,” “BE-YOU-TIFUL” and “It's Not How You Start, It's How You Finish!” the Dream Team connects with ALL students through powerful inspiring messages of hope, uplifting music and tons of motivation. The assemblies are SEPARATELY appropriate for ALL grade levels. De-STRESS the Test. Standardized Testing Success! Students and teachers alike are under considerable pressure for students to perform well on standardized tests. A little stress can keep students on their toes, but too much stress CAN knock them off of their feet. The undue stress and pressure as a result of tests can create excessive worry and anxiety. This contradicts the desired outcomes of the student’s ability to process and understand test questions and perform at their best. Dr. Brown uses inspiring and informing strategies to reassure students that the most important thing to do is to try their best. Students will be led to view testing as a challenge as opposed to a stress using a growth mindset. Master Class Course Offering - "No Excuses 247"
This master class is designed for high schoolers to college-aged young people to help them see that there are no good reasons or explanations to justify lack of effort, commitment or determination. PREREQUISITE: Be stronger than your strongest excuse. Students As Leaders. A Motivational Makeover! This talk encourages students and professionals to be PREPARED NOT SCARED for the challenges they will encounter on the path to success. It will also explore the unhealthy hip cultural idioms and trends and its all consuming and devastating impact on society. Ultimately it will empower attendees to avoid the pitfalls of “life traps,” while empowering attendees to make positive choices. Participants will learn Better Attitude Development (B.A.D.™) strategies for self-improvement. Participants will learn the importance of INVESTING IN ONESELF! Dr. Brown creatively reinforces the five descriptors that define your school's mission in terms of student outcomes. Dr. Brown's uplifting and engaging message will capture the core values of your school while ensuring students, parents and staff alike understand the importance of preparing students for success in today's competitive world. In essence, when students, faculty, administration and parents understand what their mission looks like in terms of student outcomes, EVERYONE will be better able to provide the support, education, resources and direction their students need to achieve success. 1. Students will take responsibility and ownership of their education and will commit to achieving the goals they set. 2. Students will be inspired to strive for academic excellence in a challenging, healthy, engaging, supportive and safe environment. Why Fit In When You Were Born To Stand Out? Saying Goodbye To Negative Peer Pressure! Whenever Dr. Brown is asked "How are you?" He vehemently responds "OUTSTANDING!!!" He believes that to truly be "outstanding," one would have to "stand out." Young people today get so caught up on how the world sees them and how to get the most social media attention, that they lose themselves. Once they realize that they were born to stand out, with the talents they were gifted, they can live a more filling and compelling life, that changes not only the lives for themselves, but for any person with whom they come in contact. 1. Students will learn to grow within themselves to stand out, and not try to live in a manner that is untrue to oneself. 2. Students will learn to grow in physical, emotional, health and financial areas all to not only help them find themselves, but in the end making them stand out, due to the amount of self-confidence they glow with. Dr. Brown excitingly encourages and demonstrates to students how to take responsibility for their education. Dr. Brown shares strategies for academic, career and life excellence with students, educators, administrators and parents. He encourages students to strive for their high school diploma and set goals for the next stage of life beyond high school - trade schools, armed services, college and/or employment. 1. Dr. Brown helps create a school culture that conveys a constant and consistent message to all stakeholders of the importance of graduation, education, and life-long learning. 2. Dr. Brown also offers supportive products to surround students with visual cues and symbolic non-verbal messages reminding them to focus on their future. All generations have had their fair share of challenges and crises. Today, kids are experiencing scary news on a regular basis. Everything from shootings, cyber-attacks, school violence to terror attacks have become a harsh reality. Although it may be tough, kids today can be taught to be tougher. Dr. Brown takes young people on a growth-mindset journey to find the light in the midst of so much darkness. Kids will learn that all is not perfect in the world but that they can make it better. Children notice things aren’t quite right in the world, however Dr. Brown helps them learn how to make the world a better place…starting with them. Young people will also be led to think more deeply about people’s feelings and how they can solve problems. Theme: If you get knocked down seven times, you must get up eight times. This motivational talk promotes youth inspiration in helping young people overcome a "victim mentality" and move toward a "victor mentality." This talk helps every young person realize their dreams, hold onto their dreams, and promotes the 'hero' within each youth. Each youth will realize their capacity to re-create themselves and start anew. The ability to recognize nothing is impossible, seize opportunities, and create new opportunities. The ability to rethink their priorities and reset their expectations. Often young people get discouraged when they face obstacles, challenges and hardships. Dr. Brown helps young people realize the "growth mindset" needed to overcome the seemingly mountainous ordeals they may face. 1. Young people are led to increase their belief system and confidence to do the things that appear too difficult. 2. Young people will be led to "think BIG" to achieve spectacular and apparently impossible results. This is a proven and engaging tool to improve school climate, address bystander and bullying behavior while creating caring anti bullying school communities. Create safe and caring communities by shifting power away from bullies and into the hands of the caring majority of students. Utilize a team approach to involve administrators, teachers, support staff, students, parents, and the community to change the climate in the school. A Drug-Free Me! How Will You Handle Your Storm? This assembly focuses on the message of living above the influence of drugs as well as learning about the consequences of using. Many risk factors are addressed coupled with the accompanying protective factors. 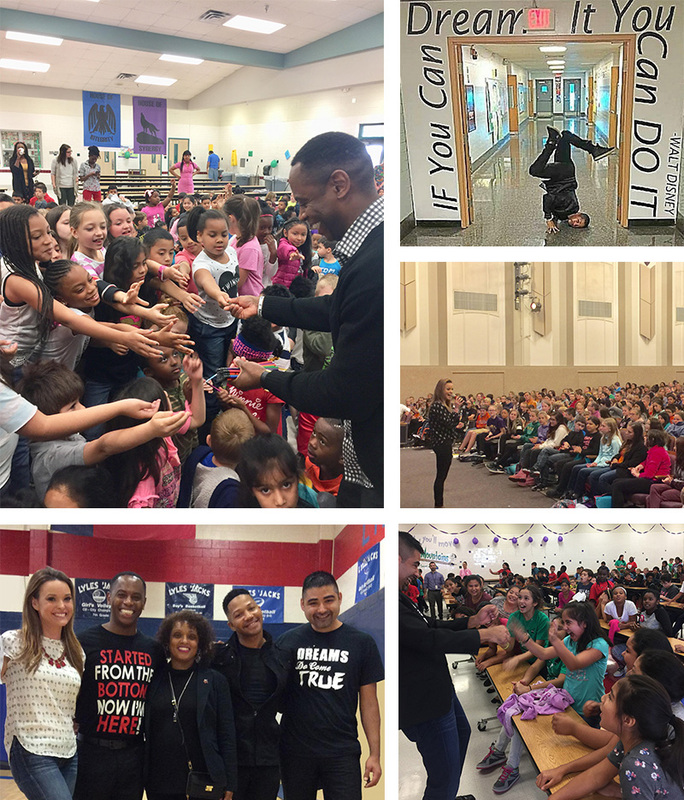 This is substance abuse and drug prevention education information & inspiration at its BEST! Learn common misconceptions leading to experimentation with drugs and other risky behaviors. Students will also explore the facts that "positive choices take you in a positive direction, and negative choices have negative consequences." Students will be empowered to embrace the belief that every storm in life is followed by a rainbow, and that dancing through the storm is a viable option. As a clinical and educational psychologist, Dr. Adolph Brown understands the importance of the capacity to feel, think and act in ways that enhance one's ability to enjoy life and deal with life and school challenges. Approximately 20% of children and adolescents are suffering from some form of mental disorder and 70% of mental disorders onset prior to age of 25. The adolescent and teen years are a critical time to promote mental health and to address any mental health problems that arise. 1. Youth will understand the warning signs of mental health problems. 2. Youth will learn strategies to improve their overall mental health.